Do we do these things from good to bad or bad to good? 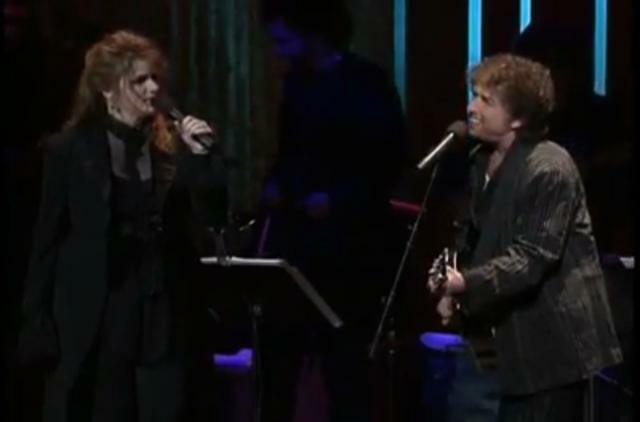 Bob Dylan had a few curious collaborations in 1994, and here’s three of them. Stevie Nicks. Sometime either in late-1993 or early-1994 Dylan showed up at a recording session for a new Stevie Nicks album, Street Angel. According to the Wikipedia entry for Nicks, she entered rehab for a pill addiction in “late-1993”, so Dylan’s collaboration with her probably took place after she got out. Regardless, he played guitar and harmonica on her cover of “Just Like a Woman” (below). This is a totally unnecessary cover of this song, with Nicks adding very little to it and Dylan adding almost nothing at all. The first time I played it I didn’t even hear the harmonica (actually, I didn’t really make it out on the second either – it is not prominent in any way), and the guitar playing could be almost any competent studio musician. Apparently this album came out at a nadir period for Nicks, where most of the coverage focused on her weight gains rather than her singing, and the whole thing was something of a flop. I had no idea it existed until the other day, and I’ll probably have forgotten it by tomorrow. I don’t have any real idea how Dylan knows Nicks, other than the idea that all famous people in LA probably know each other. I’ve seen Entourage. The best part of this fan-made video are the ultra-bizarre images of Nicks. Here he played the least duet-ish duet of all time with a sort of stunned looking Trisha Yearwood. 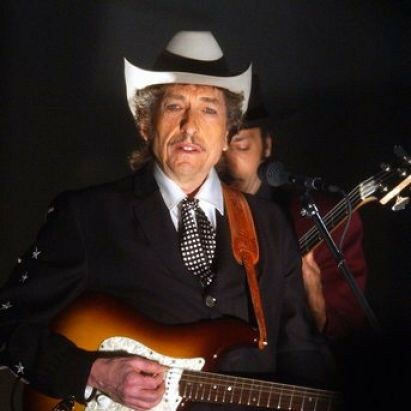 Watch as Dylan strides out on stage and launches into “Tomorrow Night” (which he had recorded on Good As I Been To You). Watch as he never even acknowledges that she is also on stage. Watch as Yearwood eyes him warily, the way you might eye a racoon who is caught under your back porch. Tentatively, oh so tentatively, she tries to come in on the chorus. I think she must wondering where he might end up going at any moment here. It doesn’t matter – it’s not like he lets her sing a verse or anything. This is one selfish performance. Also, until I saw the video below I didn’t realize that Dylan outsourced the harmonica part here. An oddity, for sure. 3. Finally, and unfortunately I can’t find a version of this on the web, in November Dylan appeared on Mike Seeger’s album, Third Annual Farewell Reunion. Seeger played banjo while Dylan sang “Ballad of Hollis Brown”. It might not be as good as Dylan sang it back in the day, but Seeger is an incredible musician and his playing is awesome here. You’re going to have to trust me – or buy the track on iTunes – but this is not just the best of this sad lot, but actually a track well worth having.